The destruction of the Jewish Temple by the Romans in 70 A.D. was recorded by the first century historian Josephus, who witnessed the events first hand. Josephus writes in his history entitled the 'Jewish War': "In the morning Titus commanded that the fires should be put out and that a road should be built to the gates to allow entry for his troops. His generals then came together to discuss what should be done with the temple. Some wanted to destroy it, because it would give the Jews a reason for uprising. Others argued that if the Jews would clear out of the temple it should be allowed to stand, but if they were to use it as a fortress, it should be destroyed. Titus then gave the command that no matter what happened, the temple should be spared, because it would always be a great tribute to the empire. Three of his chief generals agreed, and the meeting was disbanded. Babylon, the structure was doomed. The rebels again attacked the Romans after Titus retreated, and a battle took place between the temple guards and the Roman troops who were trying to put out the flames in the inner court. The Romans scattered the Jews and pursued them into the sanctuary. At the same time, a soldier recklessly grabbed a torch. He hurled the fire-stick through the doors made of gold on the north side which allowed entry to chambers around the sanctuary. On seeing the flames, a cry went up from the Jews, and caring nothing for their lives, they rushed forward to put out the fire. A messenger rushed to the tent of Titus to inform him of the fire. Immediately, Titus ran to the temple to put out the flames. But because of the battle that raged on, the soldiers either could not or would not hear his commands. The wrath of his troops could not be stopped, and at the doorway many soldiers were trampled by their own forces. There among the burning ruins they fell, sharing the same fate as their enemies. Pretending not to hear the commands of their general, and filled with hatred, the soldiers rushed on, hurling their torches into the temple. The helpless rebels made no attempt at defense. Fleeing for their lives, with bloodshed all around, many civilians were caught in the battle. Even the steps of the altar were stained with the blood of the dead. When Caesar could not hold back his troops, he and his generals entered the temple and viewed for the last time the Most Holy Place. Since the fire had not yet reached the inside, but was still feeding the outside chambers, Titus made one last effort to save the structure. Ordering a centurion to club anyone if they disobeyed his commands, he rushed forward and pleaded with his soldiers to put out the flames. But because of their hatred of the Jews and their desire for riches, the soldiers disregarded the orders of their general. Seeing that all the surroundings were made of gold, they assumed that inside -there would be great treasures. 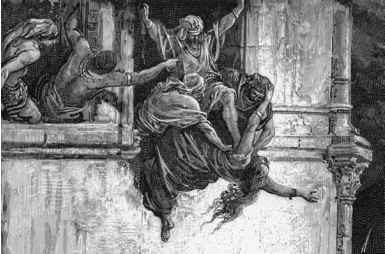 Titus then ran out to hold back his troops, but one of those who had entered with him thrust a torch into the hinges of the temple gate, and mighty fire shot up inside. Caesar and his generals fled for safety, and thus, against his wishes, the sanctuary was burned. . . . "The city and the temple was then leveled to the ground by the command of Caesar. Only the highest towers and part of the western wall remained to show all mankind how the Romans overpowered such a strong fortress." "O Jerusalem, Jerusalem, the one who kills the prophets and stones those who are sent to her! How often I wanted to gather your children together, as a hen gathers her chicks under her wings, but you were not willing! "See! Your house is left to you desolate; "for I say to you, you shall see Me no more till you say, 'Blessed is He who comes in the name of the LORD!' "
Then the Jews said, "It has taken forty-six years to build this temple, and will You raise it up in three days?" But He was speaking of the temple of His body. Therefore, when He had risen from the dead, His disciples remembered that He had said this to them; and they believed the Scripture and the word which Jesus had said. "What did the Athenians gain from putting Socrates to death? As judgement, plague and famine came upon them. What did the men of Samos gain from burning Pythagoras? Shortly after this, their land became nothing more then sand. What did the Jews gain from killing their wise King? It was just after his death that their kingdom was dispersed. God justly sent judgement for these three wise men. The Athenians died of starvation, the Samians were covered by the sea, the Jews were left homeless, having been dispersed among the nations. But Socrates did not die forever; Plato continued on with his teaching. Pythagoras did not die forever; the statue of Hera continued his legacy. Nor did the wise King die forever; He lives on in the teaching which he had given." "As he approached Jerusalem and saw the city, he wept over it and said: "If you, even you, had only known on this day what would bring you peace - but now it is hidden from your eyes. The days will come upon you when your enemies will build an embankment against you and encircle you and hem you in on every side. They will dash you to the ground, you and your children within your walls. They will not leave one stone on another, because you did not recognize the time of God's coming to you."